An interaction with Chef Sujan Sarkar, Chef de Cuisine, Olive Bar & Kitchen. 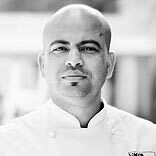 In an exclusive interview with Restaurant India, Chef Sarkar talks about the changes in food that is happening today and shares insights on how to check the healthiness of ingredients used in the menu. As a chef, you were involved with launching many restaurants in London and India. From your experience, what would you suggest to look up while preparing menu for a new restaurant? Doesn't matter if a restaurant is old or new, when I plan a menu I always stick to few points, cuisine and type of the restaurant, sourcing and availability of ingredients and innovation by tweaking the recipes. What have you learnt in the world of food while travelling from India to UK and then back to India? Food is now changing every day. To keep up the pace you have to keep your eyes open and follow the trend. Also it's very important to master your basic so that you can easily upgrade your skill and knowledge. I upgrade my knowledge on a daily basis and keep a tab on what is new in the industry. How do you check the healthiness of the ingredients used in your menu? I always try to use fresh ingredients and lots of vegetables. I use fresh fishes and lean meat or sometimes the organic produce. These days we see that five star restaurants and hotels are including street foods in their menu. What has brought the shift? As I said food is changing every day and people want to try best of everything from street food to Michelin Star. Street food is very much into fashion because of the cost effectiveness and unbeatable taste and flavour. So if we can elevate hygiene and presentation level of street food then it's a clear winner and five star hotels are doing that to go with the trend. What are the benefits/consequences of such strategy? I think benefits would be attracting more customers and to offer more choice in less price. Best part is that street food is not exclusive and can be replicated easily. How would you define the molecular and the modern gastronomy as you are an expert of it? I am working with modern gastronomy for few years now but still I should not call myself an expert. I think we should use the word modernist cuisine instead of molecular gastronomy. It is an art and science of cooking where chefs need in-depth knowledge of each and every ingredient, different cooking techniques and also use their imagination to create masterpiece each and every time which are visually stunning and packed with flavour and also has different textures. Forging for rare ingredients, also plays a major role in modernist cuisine. From where did you source the ingredients to give your food a modern touch? I source ingredients from all over Europe. Sosa from Spain, Molecular Starter Kit (MSK) ingredients from UK and Texturas product from Spain. You have completed Wine & Spirit Education Trust (WSET) Level 2 Award in Wine and Spirit making. What would you say on the wine drinking culture in India? I think people are slowly getting educated about wine and wine drinking culture. Wine drinkers are now a big community who know how to appreciate a good wine. Also now in India we are producing good quality wine so people are now exposed to that in reasonable price which is also the main reason for increase in wine drinkers. I use white wine vinegar, sherry vinegar, chardonnay vinegar, muscatel vinegar etc and also natural acids like malic & citric acid etc. Good quality sea salt preferably maldon sea salt to finish my dish. To concentrate any flavour I use ultratex (a modified starch), essential flavours and different flavour drops.